This work aims at enhancing the performances of polybenzoxazines by increasing crosslink density through introducing hydrogen bond acceptor. Additional hydrogen bond acceptor, such as 4,4′-bipyridine (Bpy), not only decreases the polymerization temperatures of bisphenol A based benzoxazines, but also modulates the hydrogen bonds. After introducing Bpy, the formation of Type I -OH···N hydrogen bonds is suppressed, while Type II -OH···N hydrogen bonds form between polybenzoxazines and Bpy. 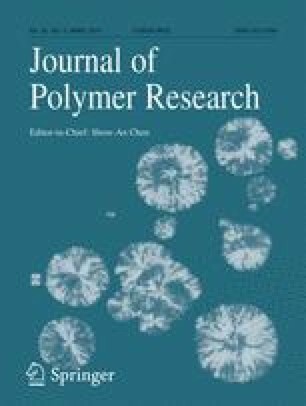 The decrease of Type I -OH···N hydrogen bonds is beneficial to the polymerization and increases the crosslink density, which improve the properties of polybenzoxazines. And the results show that, compared with neat resin, the char yield, tensile strength and toughness of the blends are enhanced. We believe this novel insight into the roles of hydrogen bonds is anticipated to help researchers explore more polybenzoxazines with excellent mechanical properties. The online version of this article ( https://doi.org/10.1007/s10965-019-1741-5) contains supplementary material, which is available to authorized users. This work is supported by the National Science Foundation of China (Project No. 21204053) and Outstanding Youth Foundation of Sichuan University (Project No. 2015SCU04A07).